Well, I always knew I was a nerd; but now this proves it. Yes, I'm going to introduce the topic of this post by—get this—drawing a comparison from Doctor Who. To be exact, I will now draw your attention to the alien species known as the Silence, which make their disturbing appearance in the seventh season of that show's reboot. These tall, suit-garbed humanoids lurk like emaciated sentinels on the periphery of the episode ("The Impossible Astronaut") in which they make their debut; they speak (gutturally), yet have no mouths in evidence (see left). In a classically Moffatian psychological gimmick, anyone who sees a Silent* loses all memory of their perturbing experience upon breaking line-of-sight with the creature; in fact, the race has coexisted with humanity throughout our history without anyone ever remembering it: rather than develop their own technologies, the Silence manipulate other species (including Homo sapiens) into doing so for them by means of post-hypnotic suggestion. These terms are a bit too broad to make a true analogy with the Silence/human association, since they denote any and all organisms that exclusively inhabit the microhabitats of termitaria and formicaria: in their entirety called inquilines (de Visser et al., 2008), with host interactions ranging from synecthrans (which are attacked by their hosts) to synoeketes (which are ignored) to symphiles (which interact directly and benignly with their hosts) (Wasmann, 1894). Examples of the latter category include microdon maggots (Syrphidae: Microdontinae), which feed solely upon the brood of ants (Cheng & Thompson, 2008) and are so morphologically specialized that they were at times mistaken for mollusks (Schlotthauber, 1840); and the final-instar caterpillars of Maculinea sp. butterflies (Lycaenidae), which have a similar diet (Thomas & Settle, 2004). The three categories enumerated above must be considered with the caveat that they are often messily delineated (Mynhardt, 2013) or downright inadequate; the beetle Aethina tumida (Nitidulidae)—an oft-pestiferous inhabitant of honeybee hives—shifts behavioral classes depending on the subspecies of A. mellifera it plagues (Ellis & Hepburn, 2006). It is symphiles that will be concentrated upon here, since it is they that actually blend into their host's society (no small feat). Communications among social insects are almost entirely chemical, governed by the concoctions of cuticular hydrocarbons (hereafter abbreviated as CHCs) present in a particular species. Social parasites must exploit these CHC signatures, both by acquiring them from the hosts in order to infiltrate a required host colony (Henderson & Akre, 1986; Cini et al., 2011) and oftentimes as a means of identifying said hosts at the outset (Kreuter et al., 2010). Alternatively, a symphile can synthesize its own CHCs: this has been confirmed for only one species (Howard et al., 1980). Life as a (probable) CHC factory can have frankly grotesque results. Many termite symphiles are palely globular (an appearance sometimes accomplished by prolonging a teneral state; Kistner, 1982) and often bizarrely bloated in the abdomen (Kistner, 1990): presumably to accommodate CHC-producing glands. The flies of Termitoxeniinae (Phoridae) are fantastical exemplars of this tendency towards a gelatinous physique: upon entering colonies of Odontotermes spp. (their symbionts; Maruyama et al., 2011a), the initially humdrum females shed their wings, with their abdomen swelling and bulging to such a point that their posteriors face directly forwards (Mergelsberg, 1935). (See the three mature examples from the Ryukyu Islands above; I cannot accredit them properly, due to my illiteracy in Japanese.) The unorthodox degree of postimaginal† growth observed in these insects is truly exceptional (Disney & Kistner, 1995). Would be exceptional, that is, if we disregarded certain rove beetles of the tribe Corotocini (Staphylinidae: Aleocharinae), a diverse taxon of guests to the Nasutitermitinae. The range of physogastry found among the corotocines is wide: some look downright conventional (e.g., Termitophya spp. ; Seevers, 1957); whereas others (the genera Spirachtha, Spirachthodes and Coatonachthodes) have such abdominal bloating as to be recurved, and are equipped with pendulous excrescences which appear to exude CHCs (Wheeler, 1928). 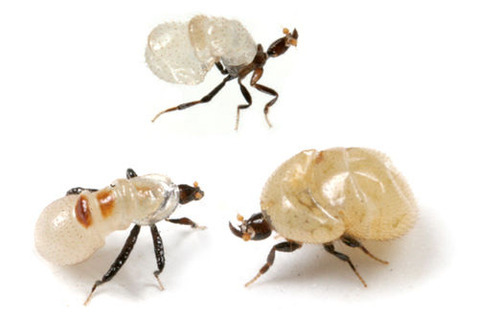 Dorsal examination of Coatonachthodes ovambolandicus suggests a further function for these exoskeletal wieners: in that species' case, the 4 pairs are arranged so as to contribute not just to the beetle's chemical mimicry of nasutitermitines, but to tactile imitation of the snotsucker-headed termites as well (Sands & Lamb, 1975). Such physical mimicry is observed in myrmecophiles prevalently among members of the Aleocharinae, the most speciose subfamily (~13,000 spp. 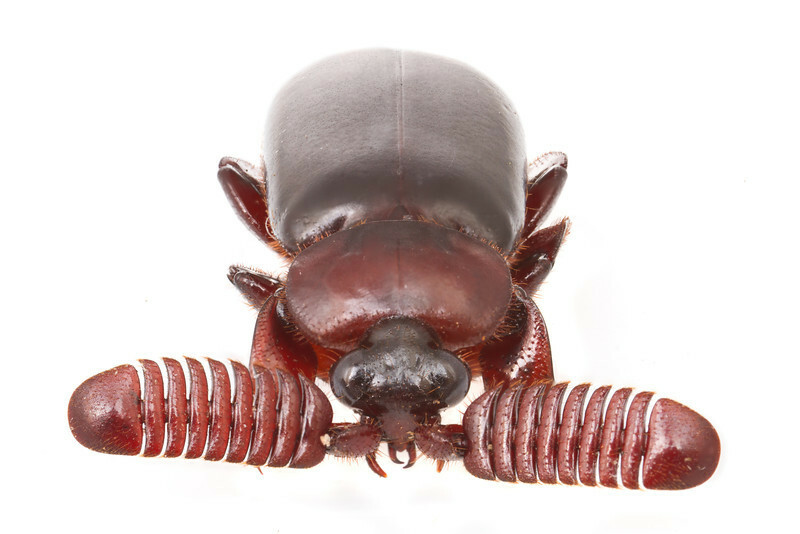 ; Thayer, 2005) of the most diverse beetle family (Staphylinidae—57,000 spp. ; Chatzimanolis et al., 2012). (See the selection at right). Along with the contrastingly squat Pselaphinae (another staphylinid subfamily; Newton & Thayer, 1995), they constitute the two largest beetle taxa in which myrmecophily is most impressively prevalent; although no list of major radiations of coleopteran ant inquilines would be complete without mention of the Paussinae (Carabidae), with their unmistakably modified antennae. 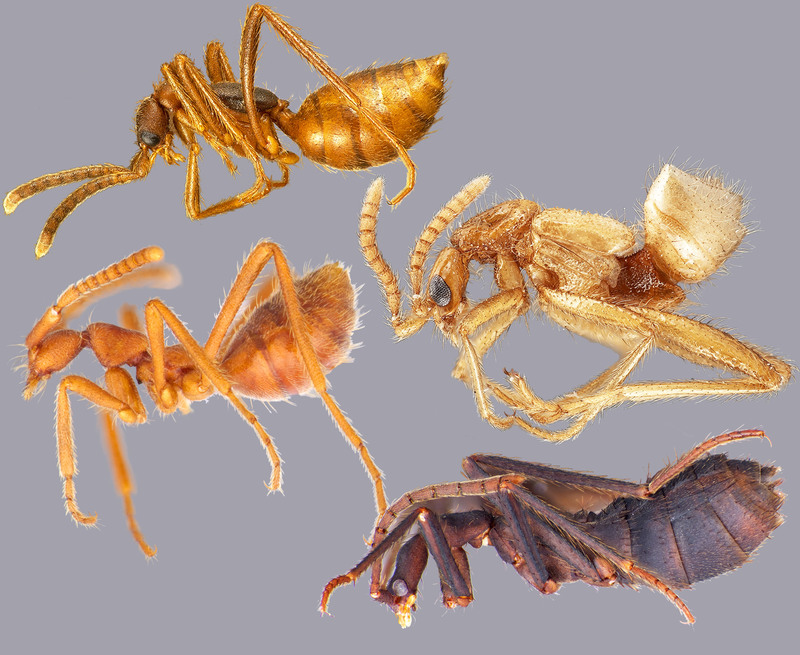 Interestingly, myrmecoid aleocharines are restricted to the colonies of army ants (Dorylinae, Ecitoninae, and Aenictinae—not to mention the ponerine genus Leptogenys) (Hlaváč & Janda, 2009; Parker & Eldredge, 2012): this phenomenon's evolutionary cause can be traced to the fact that these superorganisms engage in conspicuous swarm-raids, the entomofauna flushed out by which are a popular source of food for vertebrate predators (most famously antbirds; see below). Whilst hunting, however, these said predators carefully avoid devouring their dorylomorph benefactors (Willis & Oniki, 1978)—hence the adaptive pressure for the myrmecophiles that run amongst army ant raids to visually resemble ants (Kistner & Jacobson, 1990). As a corollary, myrmecoids that solely inhabit ant nests do not chromatically match their hosts (Jacobson & Kistner, 1991). †Following the completion of a holometabolous insect's metamorphosis. Disney, R. H. L. and Kistner, D. H. (1995). Revision of the Afrotropical Termitoxeniinae (Diptera, Phoridae). Sociobiology, 26, 115-225. Henderson, G. and Akre, R. D. (1986). Biology of the myrmecophilous cricket, Myrmecophila manni, Orthoptera: Gryllidae. Journal of the Kansas Entomological Society, 59(3), 454-467. Kistner, D. H. (1982). The social insects' bestiary. In Herman, H. R. (ed.) (pp. 1-244): Social Insects (vol. III). New York: Academic Press. Kistner, D. H. (1990). The integration of foreign insects into termite societies or why do termites tolerate foreign insects in their societies? Sociobiology, 17, 191-215. Kistner, D. H. and Jacobson, H. R. (1990). Cladistic analysis and taxonomic revision of the ecitophilous tribe Ecitocharini with studies of their behaviour and evolution (Coleoptera, Staphylinidae, Aleocharinae). Sociobiology, 17, 333-480. Kreuter, K. R.; Francke, W. and Ayasse, M. (2010). Specialist Bombus vestalis and generalist Bombus bohemicus use different odour cues to find their host Bombus terrestris. Animal Behavior, 80, 297-302. Mergelsberg, O. (1935). Über die postimaginale Entwicklung (Physogastrie) und der Hermaphroditismus bei afrikanischen Termitoxenien (Dipt.). Zoologische Jahrbuch (Anatomischen), 60, 345-398. Newton, A. F. and Thayer, M. K. (1995). Protopselaphinae new subfamily for Protopselaphus new genus from Malaysia, with a phylogenetic analysis and review of the omaliine group of Staphylinidae including Pselaphidae (Coleoptera). In Pakaluk, J. and Slipinski, S. A. (eds.) (pp. 219-320): Biology, Phylogeny and Classification of the Coleoptera: Papers Celebrating the 80th Birthday of Roy A. Crowson. Warsaw: Muzeum i Instytut Zoologii PAN. Newton, A. F.; Thayer, M. K.; Ashe, J. S.; and Chandler, D. S. (2002). Staphylinidae Latreille, 1802. In Arnett, R. J. and Thomas, M. C. (eds.) (pp. 272-418): American Beetles (vol. 1). Boca Raton: CRC Press. Sands, W. A. and Lamb, R. W. (1975). The systematic position of Kaudernitermes gen. n. (Isoptera: Termitidae, Nasutitermitinae) and its relevance to host relationships of termitophilous staphylinid beetles. Journal of Entomology (B), 44(2), 189-200. Schlotthauber, A. F. (1840). Über die Identität der Fliegenmaden von Microdon mutabilis (Meigen) mit den vermeintlichen Landschnecken Scutelligera (v. Spix) und Parmula (v. Heyden); sowie morphologische, anatomische und physiologische Beschreibung und Abbildung ihrer Verwandlungsphasen und ausführliche Naturgeschichte derselben: zur Kenntnis der Organisation, der Entwickelungs=und Lebenswise aller zwentflügligen Insecten überhaupt. In: Verzeichness der Mitgleider der siebenzehnten Versammlund der Gesellschaft der deutschen Naturforscher und Ärzte, 1840, 814-947. Seevers, C. H. (1957). A monograph on the termitophilous Staphylinidae (Coleoptera). Fieldiana: Zoology, 40, 1-334. Thayer, M. K. (2005). 11. Staphylinoidea. 11.7. Staphylinidae Latreille, 1802. In Beutel, R. G. & Leschen, R. A. B (eds.) (pp. 296-344): Coleoptera (vol. 1). Morphology and Systematics (Archostemata, Adephaga, Myxophaga, Polyphaga partim). Handbook of Zoology, vol. IV, Arthropoda: Insecta, Part 38. Kristensen, N. P. and Beutel, R. G. (eds.) Berlin: De Gruyter. Thomas, J. A. and Settle, J. (2004). Evolutionary biology—butterfly mimics of ants. Nature, 432, 283-284. Wasmann, E. (1894). Kritisches Verzeichniss der Myrmecophilen und Termitophilen Arthropoden. Berlin. Wheeler, W. M. (1928). The Social Insects: Their Origin and Evolution. New York: Harcourt, Brace & Co.
Wilson, E. O. (1971). The Insect Societies. Cambridge: Belknap Press.